Healthcare • Government • Financial • Legal • Library/Education • Business & Mfg. Need a signature? Arrow shaped page flags direct attention immediately to where it's needed saving you, your clients and your co-workers time. Color coordinate the signatures you need by assigning a different color for each person who needs to sign with red, yellow, blue, orange and green page flags. 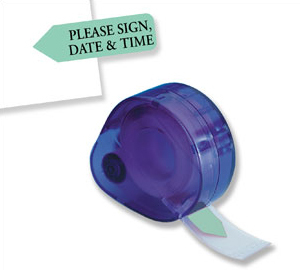 Be more productive, indicate what action is needed quickly and clearly with pre-printed page flags. With action phrases such as Please Sign & Date, Please Initial, Please Sign & Return, Missing Information, Rush!, Notarize and Dictation Needed will save you, your clients and your co-workers time by getting what's needed quickly and clearly. Franklin Mills Co. - Experience is the difference.